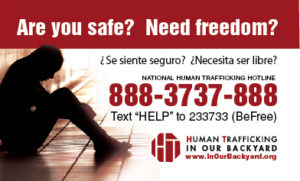 If you are being hurt and need help either dial 888-3737-888 or text 233733 and text the word HELP, someone will respond immediately, or INFO if you are seeking information about trafficking. To request help or report suspected human trafficking, call the National Human Trafficking Resource Center hotline at 1-888-3737-888. Or text INFO or HELP to: BeFree (233733). You can also report suspected trafficking online here.